Lucia identified as a dancer, more specifically a ballerina. She discusses how after her amputation this identity was forced to change and the difficulties that come with it. Her amputation occurred as a result of medical negligence whereby the bone in her ankle became infected with salmonella which continued into seven years of struggling with septicemia. Salmonella can be a common cause of bone and joint infection when its presence is not detected early enough and treatment options often lead to the need for amputation. Lucia mentions that many amputations occur as a result of infection and these dangers should be addressed with more attention. The way to make people aware of these risks is through education and awareness. Lucia wisely advises against stunting your emotions in an effort to run from pain. Substance abuse is common in individuals experiencing emotional and physical pain. By being open about the realities of amputation she advises those in a similar position to take action. Her life experience and candor make her approachable and empathetic to those seeking solace through someone who will not only be sincere but frank when it comes to life after amputation. Jaco Deist is an orthotic and prosthetic professional who can help you on your journey to recovery just as he did for Lucia. Once she had revision surgery her phantom pain went away. Phantom pain is the case when a limb is completely or partially removed but the pain is still present despite the part of the body with the original pain causing affliction having been removed. She now has a comfortable prosthetic which she uses daily, without pain. Lucia advises amputees with time to make the decision to see an orthotist or prosthetic professional who can give you all the information you need before making the informed decision in the case of elective amputation. The prosthetist and orthopedic surgeon can then work together as a team to give the patient the best quality of life possible after the amputation. This allows the prosthetist to know beforehand where the scar tissue will be and how to fit the prosthetic once the amputation is successfully completed. By having the prosthetist and orthopedic surgeon work together the final result is that of a multidisciplinary team effort. Lucia identifies that your support system will help you get through your grief period and move on with life, whilst not forgetting to be kind to yourself. 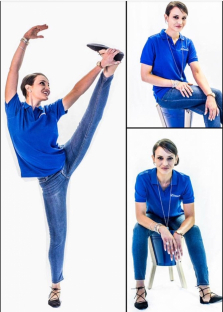 Jaco Deist is a part of her journey having fit Lucia with an Össur ProFlex Align Foot. It is an adjustable foot with an energy heel which is kinder on the residual limb and provides fantastic balance. With a delicate heel to toe rotation allowing for the added comfort that comes with the added balance the foot is a highly functional prosthetic. She does maintain that to get there, even with the amazing prosthesis available today, you must work closely with your prosthetist. By forming a lifelong relationship with someone who will become intimately in tune with your particular situation and needs, your journey of living with a prosthetic will be a much more smooth and comfortable one. Jaco Deist is accessible and will help you when you need it, simply because he is passionate about having an influence on you being able to live your best life. Be inspired by Jaco’s previous patient’s Succes Stories. If you need help, just ask. Contact Deist & Associates Prosthetic Centre for any and all of your orthotic and prosthetic needs.